We are continuing our#WhyITeachInCUHSD series this week to shine a light on our teachers and their experience at CUHSD schools throughout the recruitment season. 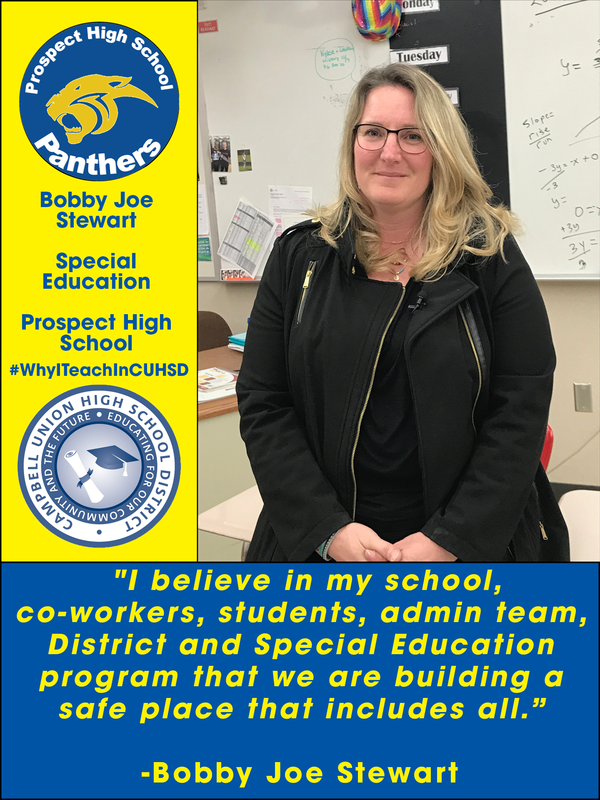 This week we are spotlighting Prospect High School special education teacher Bobby Joe Stewart, who was once a Prospect High School student herself. She decided to become a teacher because she wanted to give back to the community she grew up in. “The most important part of my vocation is seeing a student grow academically, socially, and emotionally,” said Stewart. Stewart decided to join the CUHSD family because she saw how the District and school-site staff supported the shared goal of raising academics for all students, no matter how much support they need. have the chance to learn along with their peers without special needs and are given the same chances as all students at all opportunities,” said Stewart. “We provide support to students with special needs in one-on-one support during study hall, pulling students into smaller environments to work on some challenges they are facing. We also make sure that teachers are supported on how to incorporate those accommodations as well as implementing those accommodations, ” said Stewart.